Atlanta (CNN) — A search-and-rescue team on Monday found the body of a missing hot air balloonist who had crashed in Georgia three days earlier. Acting on a tip from a witness who saw an object falling Friday, authorities dispatched a helicopter in the direction she described and quickly found the body of Ed Ristaino of North Carolina, according to Ben Hill County Sheriff Bobby McLemore. 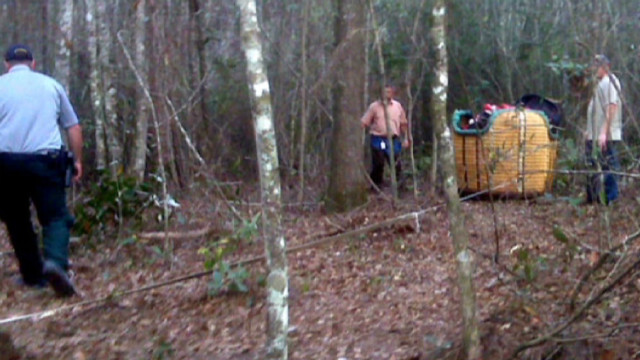 Teams made up of state patrol officers, forestry units, neighboring sheriff’s department personnel and volunteers scoured areas east of Fitzgerald in south-central Georgia, where the balloon basket went down. At least seven helicopters and planes and more than 100 people on the ground participated in the difficult search, McLemore said. Ristaino had taken five skydivers up in his hot air balloon around 6:45 p.m. Friday when he noticed the wind picking up and realized he was driving the balloon toward a large incoming storm system, McLemore said. While the five skydivers landed safely and were picked up, Ristaino and the balloon continued heading southeast and rose another 2,000 feet, McLemore said. “He went up into the clouds and had radio contact with his ground crew and told them it was hailing on him, there was lightning and rain and heavy wind,” he said. An updraft carried Ristaino up to about 17,000 or 18,000 feet above ground before a downdraft collapsed the balloon and sent him plummeting. Ristaino stayed calm and talked to his ground crew on the radio the entire time he was falling. “I’m in trouble. I’m falling. I don’t have anything above my head,” McLemore recalled from accounts told to him. The balloonist said he was falling at 2,000 feet per minute, but an altimeter reading says he may have been falling as quickly as 60 to 90 mph, McLemore said. “He was very much a gentleman and it doesn’t surprise me at all that he managed the situation and had his skydiver passengers get out of the balloon for their own safety,” said Bob Tettman, a fellow balloon pilot.